David Brooks is Sarah Palin. You can see what I mean in five minutes with today’s Times op-ed page. On the one hand, this, from Brooks. On the other, this from Paul Krugman. I have to admit to a certain weariness of spirit everytime I pick up Brooks’ “work” (sic — ed.) these days. How often must one say the same thing in a slightly different context: that Brooks is a glib hack, too lazy to do even the minimal work required to flesh out his preconceptions with even the most fragile of veneers of fact or experience? I complained here that he wasn’t even trying anymore, and nothing in today’s effort suggests otherwise. So here goes. Today, Brooks argues (a) that because Palin spoke in complete sentences, she met the “survival” test; (b) she was just folks, and though such casual style won’t wash in the elevated circles in which Brooks travels, it could do very well out there in flyover country. To many ears, her accent, her colloquialisms and her constant invocations of the accoutrements of everyday life will seem cloying. But in the casual parts of the country, I suspect, it went down fine. Memo to all those casual parts of the country. Now y’all know what Serious ™ conservatives think of you. Last, Brooks alleged that Palin had reached debate parity with Biden; that she was a radical alternative to Washington insiders; and that, while no game-changer, her performance was an unexpected, “vibrant and tactically clever” tour de force. There are of course, problems with this interpretation. Two big ones. The first is that the column as a whole is a list of nicely constructed platitudes presented with no clear connection to what actually happened. In fact, much — really most — of the piece could have and may well have been written before 9 p.m. last night. Except for the fact of Palin’s black suit, and the fact that she can pronounce the name of the president of Iran, more than half is Brooks waffling on about terrified GOPers hiding behind sofas and the grand significance of casual Fridays to the great scheme of things. Such airy generalization is the trick that bored college students use to flesh out the last three hundred words of an eight hundred word assignment. As I’ve said before, if I were surnamed Ochs or Sulzberger, I’d want a refund. But this same laziness – or worse — caused Brooks to miss the key story he thought he was covering. The question the post-debate polls asked was simple and obvious: Did Palin do what was necessary in the debate? Did the debate persuade the uncertain that Palin was ready for the job she seeks? Brooks can’t answer that question. He couldn’t even ask it, because unlike musings on politics as performance, this one could be answered in ways he still does not wish to accept. And it was: within the statistical limits of the polls, the answer was no; her numbers on this question were effectively unchanged, at least as a first reaction to the debate. That fact leads to the conclusion that Brooks is struggling to avoid: The fact that Americans by a notable majority in the context of such a divided electorate see her as unqualified reflects not on her, but on the man with whom those polled disagree: John McCain. This blog exists as a defense of empiricism and the use of the analytical methods of science to interpret the raw data of experience. There are, of course, lots of pundit/hacks who daily commit sins as bad as those of Brooks — willed ignorance, cherrypicking of data, ignoring contrary facts, howling intellectual solecisms and all the duplicitous arsenal of the ideologically blinded right. But I have to confess that Brooks gets my goat more than most precisely because of his pretention to scientific respectability — his musings on neuroscience, his assertion of soft-science knowledge and authority. It’s BS — a facade and a fraud. Today’s offering is the latest of a “what I thought while seated in the smallest room of the house” tossed off little number. We deserve better from the New York Times. Hell — the Right deserves better from somone supposedly representing the view from that side of the debate in the most visible of positions. And of that David as Sarah reference: Compare Brooks’ offering today with Krugman’s. Now, whatever you think of Krugman, he is, like Biden, expert in his area, aware of the ground of experience, deeply knowlegable. His column today, not about the debate, focuses instead on the financial crisis and its broader economic implications. It’s not a particularly data-dense column — but it makes reference to facts, it suggests reasonable inferences from those facts; it provides a framework for pursuing some of the top level claims more deeply (and Krugman does, in fact, get you the latest awful numbers for you in his first blog post of today) and so on. Again — while I’m a Krugman fan, others surely disagree. But when they do they are forced to engage him on the ground of the data and his argument. Brooks exerts no such compulsion. He has his talking points; he is glib and plausible. Pushed even a little, it becomes painfully obvious that there is no there there. Isn’t in time the Times had mercy on this out-of-his-depth man and sent him back to the Weekly Standard wading pool in which he can’t hurt himself so easily? 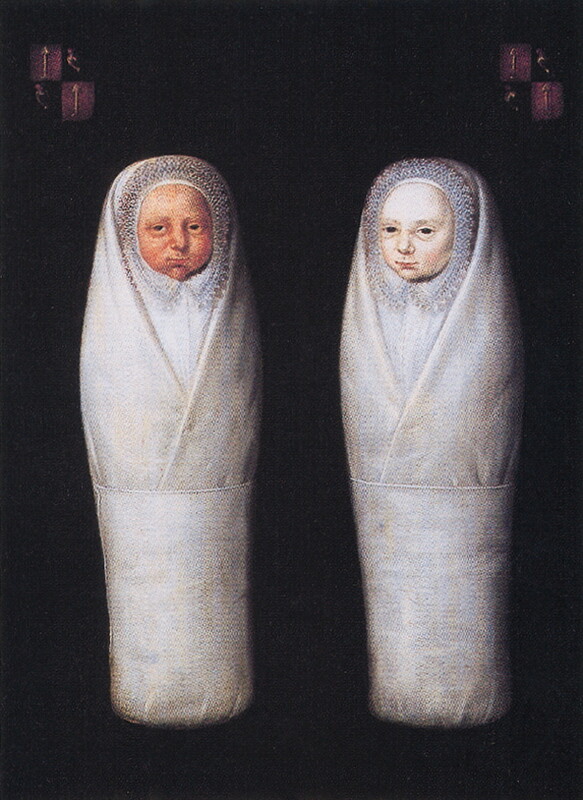 Image: Artist unknown, “The Swaddled Twins” dated 7 April 1617. Source: Wikimedia Commons. I’ve hammered on the theme that the goal of getting the public to understand science has little to do with specific facts or even ideas, and much more with helping folks master analytical tools that will help make pull the signal out of the noise of events and the day-to-day business of living. I’ve argued that such an effort begins with developing a familiarity not so much with math as scientists and technologists think of field, but with much simpler approaches to quantification. A little arithmetic goes a long way, as does what is to me the single most important idea: this kind of basic math creates abstractions that, properly employed, allow us to find deeper points of contrast or similarity between disparate events than raw facts, even raw numbers ever could. The best example (IMHO) that I’ve come up with came in this post. But John McCain’s to-me bizarre selection of Sarah Palin as his running mate provides another opportunity to deploy some simple quantification to provide a little insight into how odd — and ultimately, how bad — a choice that was. The basic argument against the Palin choice is all over the blogosphere. You can look Steve Benen (from the left), Andrew Sullivan from the non-base right, and Ramesh Ponneru enjoying a moment of clarity in the opium – den end of wingnut right for variations on the theme. They all argue, and I agree, that the choice is a bad one from because she is in fact desperately unprepared for the job. The reasoning behind that argument is pretty simple and to my mind compelling: leadership in her local PTA, a mayorality in a small town, a couple of stints on appointed state boards and something like 20 months as governor of a state whose population — 683,000 or so, is less than that of the Boston metro area in which I make my home– doth not a potential president make. Lots of specific issues are already coming up, but that’s the basic story. But there is a counter argument: conservative hacks (Ralph Reed on NPR this morning, for example) are trying to suggest that her executive experience as Mayor and Governor make up for her deficiencies in national security, international affairs, national issues and so on. It’s a pretty risible argument, but how ridiculous it is can only be seen with a clear idea of the scale of the jobs she has done so far to see just how much love to give her, and McCain, on this score. So, at last to return to the premise of this post, that a little help from numbers can reveal a great deal, what can we find that would help place Palin’s level of competence in context? First let’s constrain the analysis and accept the apparent McCain campaign judgment that especially after the events of the last week or so, a female veep selection was essential. That leaves several potential picks mentioned over the last week, perhaps the most prominent of whom was Texas Senator Kay Bailey Hutchinson. Now whatever you may think of her views (not much, from where I sit), Hutchinson is a conventionally serious choice: she had executive responsibility as Texas State Treasurer (briefly, but longer than Palin has been governor of a state with the population of one of Houston’s suburbs); she’s into her third term in the Senate with big time committee appointments (on Appropriations, Veterans Affairs and Rules and Adminstration, ranking member of Commerce, Science and Transportation); she’s won elections in a large state; and she knows how Washington works. Seems like an obvious choice. She did not light a fire under the anti-choice base, but there is no doubt that she is a national figure dead in the mainstream of the Republican party. Her resume trumps Palin’s in every particular. But let’s give McCain the benefit of the doubt on another constraint. In a change election, watching Obama driving the message home brilliantly over the last week that Washington insiders are the problem, it is a plausible argument that the woman the campaign concluded it needed had to be someone from beyond the Beltway. So far, Palin meets these criteria: she’s definitely got a pair of X chromosomes and Juneau is about as far (barring Honolulu) as you can get from Washington in American politics. Maybe, following this decision tree, once you impose these narrowing filters, Palin was as good as it gets. Or not. Another name that came up from time to time in the search was Carly Fiorina, the former Hewlett Packard CEO. Now this is a harder comparison to make between than that between Hutchinson and Palin — after all, how do you rate corporate life to work in government? You look to the numbers. Both Alaska and HP are economic ecosystems. They generate wealth, must be governed, have operations and a bottom line. The comparisons are imperfect, but they give an idea, most importantly of scale, of how big a job each of these executives have performed. In 2005, (the last year for which I could find the data in a quick troll) Alaska’s gross product — all of its economic activity — totaled just a whisker less than 40 billion dollars. For 2005 — the last year during which Fiorina worked for the company, HP’s total revenue — the value of all its economic activity — more than doubled that number, topping 86 billion. That comparison drastically understates the disparity in managerial responsibility between the two. Last year, Palin signed into law her first budget – Alaska’s largest ever : 6.6 billion. For 2005, HP made a profit of 3.473 billion, which, deducted from gross revenue, leaves about 83.5 billion out of the revenue total that had to be spent to make that money. Certainly there would have been passive expenditures there, already agreed interest on loans, for example, as there are certainly automatic payments within a state budget. But broadly speaking the comparison is overwhelming: a CEO of a major company has much more fiscal responsibilty and a much larger economica strategic burden to handle than the leader of a small government administration — by about 13 to 1 on the numbers in this case. Now this is not an argument that Carly Fiorina should have been standing next to John McCain today. That there are all kinds of considerations that go into such decisions has been amply demonstrated by the choices of both Joe Biden and Sarah Palin. But if you are trying to get a handle on just how far Palin’s experience has been from the level of responsibility that goes into leading the United States of America, it is worth remembering that in her one supposed area of expertise is as an executive. And in that role, her 20 months of running the Alaska budget is loosely equivalent to the mangerial task of handling the revenues of the 348th largest company in America, which in 2007 was the Ball Corporation, the fourth largest packaging and can company in the country. And in case you were wondering: the 2007 budget for the United States of America topped 2.7 trillion. Just to finish this off: McCain, Obama and Biden have never had to adminster an operation larger than their Senate offices, or for McCain, a peacetime bomber squadron. But they didn’t claim that attribute, offering instead claims of judgment, experience, temperament, knowledge of the affairs of the nation and so on. By contrast, “executive experience” is Palin’s only alleged skill in governance. So the two points I hope this post makes are (a) that there are ways to think about making rational comparisons between potential leaders, and they include at least some willingness to think if not mathematically, at least arithmetically…and (b) that as expected from a first review of her resume, this just slightly deeper look into the numbers supports the proposition that Sarah Palin is the most unqualified Vice Presidential candidate in living memory.